Twelve-month VeroFORECAST predicts USA average property value appreciation of 4.5%. RENO FORECAST- property value appreciation of 10%! 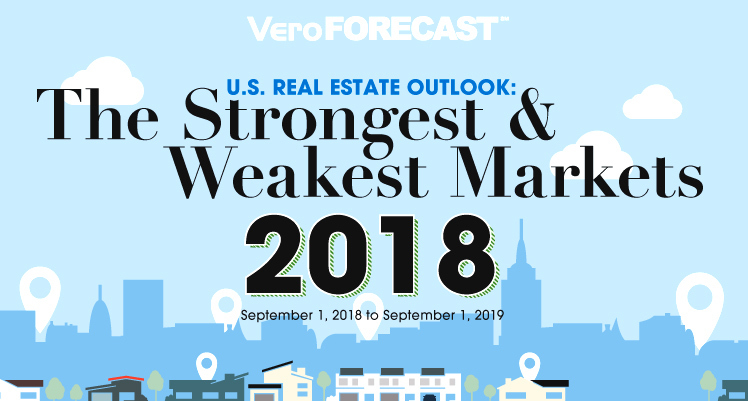 Veros® Real Estate Solutions (Veros), an award-winning industry leader in enterprise risk management, collateral valuation services and predictive analytics, has released its third quarter 2018 VeroFORECAST™, with predictions of how property across the nation will fare between September 1, 2018 and September 1, 2019. "Our latest VeroFORECAST indicates that on average, for the top 100 most populated metro areas, we expect 4.5% appreciation over the next 12 months," said Eric Fox, VP of Statistical and Economic Modeling at Veros. "This is the 25th quarter in a row where this index has forecast overall appreciation. We are forecasting that the overwhelming number of metros across the nation, approximately 97 percent, will appreciate. The fact that these averages are identical to those of last quarter's update indicates that we are seeing consistency in nearly every metro market." 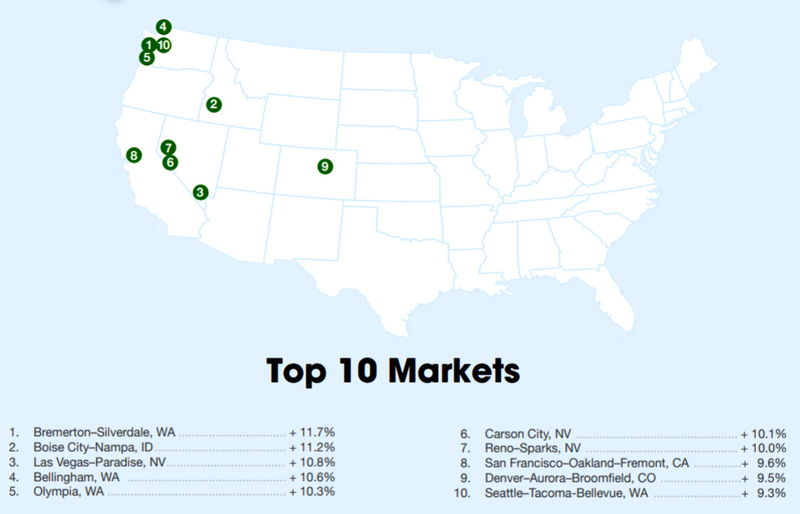 Western states continue to hold all top ten spots, with forecast appreciation rates running roughly between nine and 12 percent. Seven of those MSAs with the highest-projected appreciation are in Washington and Nevada, with the other three in Idaho, California and Colorado. 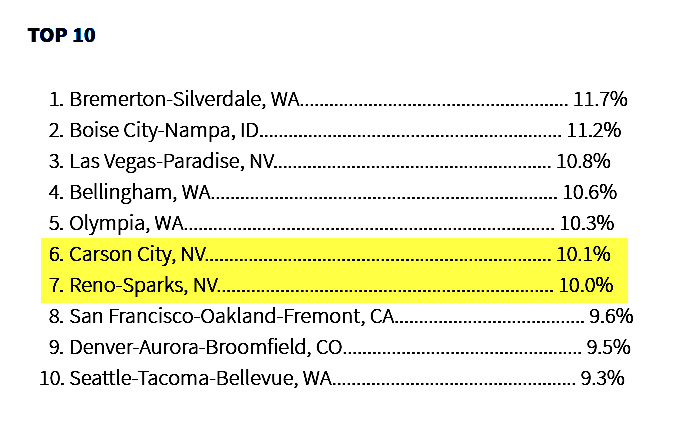 Another Western state, Utah, is also projected to be a solid performer. These five states, along with Oregon, have provided the index's highest-ranked markets throughout 2018. "This is a very strong showing, with the average appreciation of the Top 10 markets forecast to be a half-percentage point higher than in our last report," Fox said. He added that, from an overall perspective, the latest report signals "more of the same" for property values in these markets. "VeroFORECAST data benefits anyone with an interest in real estate values" said Veros President and CEO Darius Bozorgi. Independent analysis shows that we have been delivering the industry's most accurate forecast data for more than fifteen years now, outperforming all other providers." Silicon Valley firms from Apple to Tesla have set up operations in the Reno area, bringing waves of well-paid tech and manufacturing workers. At the same time, California's soaring home prices and rents have sent thousands of people across the state line looking for more affordable housing.